Viveland, HTC's VR arcade, opened in Taipei eight months ago, with the Taiwanese company calling it the "world's first premium VR arcade." It has three jobs: make money, sell people on VR and serve as a testbed for future arcades that HTC plans to build around the globe. Since Engadget was in Taipei for Computex, it made sense to take the short cab ride across town to sample its charms. Now that I've seen Viveland and experienced what it has to offer, it's clear what these facilities need in order to succeed. High-end PCs and VR headsets are important, sure, but it's the social experience that will determine Viveland's success. VR arcades aren't new; there are thousands in Asia and a small but growing number in the United States and Canada. The most famous of those is probably The Void, which has a huge location in Utah and is also behind the Ghostbusters: Dimension exhibit in New York. A few smaller businesses have also opened up on their own, but we're not -- yet -- at the point where everyone has access to one. 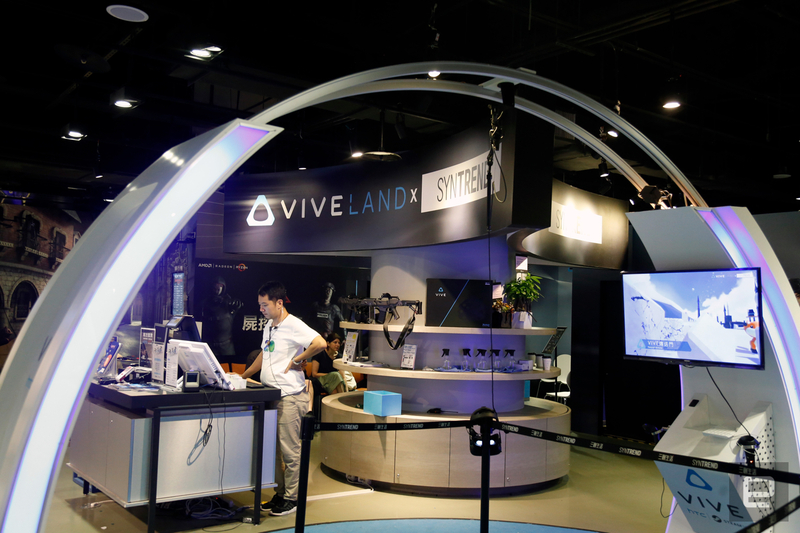 Viveland itself occupies roughly a third of a floor inside Taipei's Syntrend, a shopping-mall paradise for technology enthusiasts. 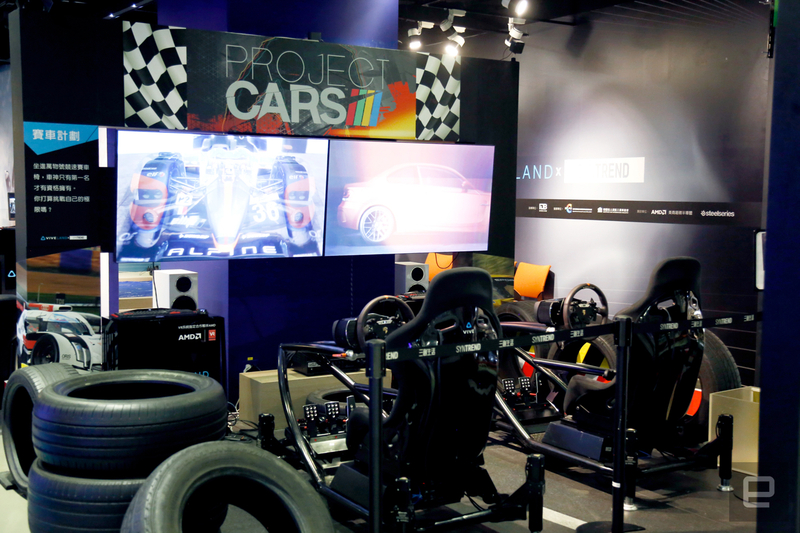 It features a number of VR stations across its front, showcasing games from Front Defense and The Walk through to Project Cars. Around the back, a number of closed booths offer other games, including team shooters Dinosaur Commando and HordeZ. Booths can also be rented for blocks of 30 minutes at a time for NT$400 ($13), while an individual session costs around NT$200 ($7). It's fair to say that launching a one-of-a-kind VR arcade wouldn't have been cheap, but very little of that cash is visible. Viveland's an experiment that's been open for less than a year, yet it already has the well-worn shabbiness of a laser-tag arena. In fact, there are more than a few similarities between a VR arcade and that mainstay of '90s shopping malls. But perhaps that's part of the charm; a duller real world will help make the virtual experiences just a bit more vivid. As for the games, Front Defense is a WW2 shooter that sees you as a solitary resistance fighter defending a fixed position from an advancing army. The title, which was announced last year, gets you pretty sweaty as you skulk around the sandbags grabbing weapons. But, ultimately, the sandbags and lighting that surrounds the booth are little more than theater for those watching you take part. On the other hand, the Project Cars setup harnesses a pair of VR racing chairs very few could afford to own in their homes. Racing around the track, you feel every jerk and shudder of the race, and I was told that if I started feeling nauseated to alert the attendants immediately. It's easy to imagine that VR experiences like this would be an easy sell for virtual petrol-heads looking for a thrill. But neither of those games were particularly gee-whiz, even to someone with little VR experience like myself. That's because the former could easily have been played at home, and the latter is like every other premium racing sim on the market, albeit with VR. I couldn't imagine traveling to the other side of the world, or to my local mall, to experience either, but that's not where Viveland's strengths reside. Dino Commando requires four players to stand in formation against an on-rushing army of velociraptors in the ruins of a city. It's a title that goes up against the limits of VR, and having the dinosaurs clip into you as they attack helps break the player's suspension of disbelief. But that's not the point because what made it fun was playing it together with your friends in a social context. Yes, games like this can be played online, but there's a reason people still drag their gaming laptops over to their friends' homes. Similarly, HordeZ, an on-rails survival shooter in which you combat an army of the dead, is a hundred times better with friends. Our quartet began as an uncoordinated team, but as the game's intensity increased, we began barking orders at each other to direct our attacks. It's the same sort of thrill that you may have felt half-sprinting through your local laser-tag arena. But that's exactly the sort of feeling that Vivelands of the future will need to capture to have any hope of becoming a hit. Star Trek: Bridge Crew wasn't available at Viveland, although HTC recently announced that the title would pack in with new Vive headsets. That, similarly, is a collaborative gaming experience that's far more enjoyable when played together rather than apart. Part of the charm is that interacting with your friends helps bridge the isolating effects VR sometimes causes. It's also something I'd expect to see at future Vivelands because just needs players to sit down rather than stand. My experience at Viveland has taught me that a VR arcade's greatest strength is tapping into that sense of wonder you can only get exploring new worlds with friends. Yes, you can scale virtual mountains or shoot digital dinosaurs on your own, but it's far less meaningful if you can't feel the people beside you. Since it would be prohibitively expensive to kit out your own home with this gear, an arcade makes perfect sense. 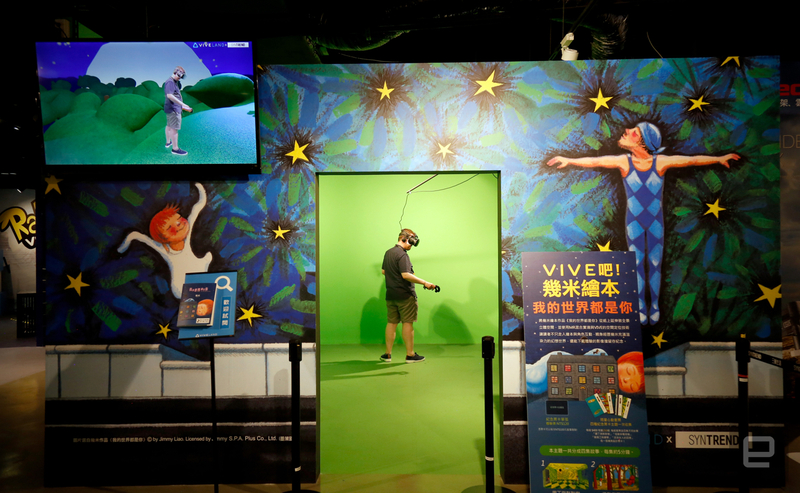 Viveland also houses a mixed reality studio, which is exhibiting a title based on the Taiwanese children's book All of My World is You by Jimmy Liao. It features the player helping a small girl get over the death of her pet dog by growing a tree pig for her to play with. A pair of small children took turns playing the game during my visit, and the squeals of delight coming from the studio were infectious. Not to mention, of course, that it's a great ad for those folks who don't just want to shoot stuff in VR. I don't know if it's concerning that there were very few VR-specific announcements at this year's Computex, a sharp turn from last year's show. Maybe it's not, however, because solid hardware is already available and it's now down to developers to just produce more content for it. And with E3 coming up in a few weeks, companies may be holding their big announcements another week before revealing what's coming. We can only hope. Viveland itself has proved to be a hit, with the company claiming that it's almost always full on weekends. According to HTC's Plutarch Lee, the arcade is also running at "70 percent capacity" during weekdays, so there's clearly some demand for it. HTC is also working hard to enable others to launch their own arcades with the Viveport licensing program. But for all of this, it's obvious that if HTC wants to own the future of VR, it's going to have to start running the hard yards itself. That might just be what's needed to engage an indifferent mainstream in the future of social entertainment. Chris Velazco and Richard Lai contributed to this report.